I’ve written about tracking personal expenses, and it really helps to have receipts when you pay in cash. I use cash for most day to day purchases and I’ve discovered that most places will NOT give you a receipt when you pay in cash. Which forces me to ASK for one so I can enter it into my expense tracker later. I’m not quite sure why some businesses don’t give a receipt, maybe they are saving costs by not using the thermal receipt paper for cash paying customers. A better answer may be this, what is being purchased is a consumable item and therefore a customer is not likely of returning said item, so no receipt. Who knows. Yet, when I go to a retailer that WANTS feedback (some really beg by giving longer and longer receipts), I get a receipt that is way longer than is needed. 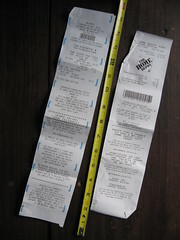 Now, I do need the receipt for any potential item return purposes, but some of the length of these are crazy. Who is really calling the 1-800 number or going to the website on these receipts? I would guess that a very small fraction of people vs receipts given. Another horrible practice is spreading the receipt vital data (stuff you need to keep for a return) among the survey/ads so you just can’t cut off the part you don’t need. Also, some businesses sometimes think of receipts as advertising or up-selling (they likely get paid for it), then proceed to give you a receipt with a discount on a competitor item (never on the brand you purchased which can be annoying). All this adds to the heft of the receipt or another piece of paper. Lastly, when are the retailers ever going to get off the thermal paper receipt? To me the thermal paper is delicate and any excessive heat or oil erases the information on the receipt (often I can’t find the date or amount when entering expenses after a week). I don’t even know how bio-degradable the thermal paper is (something I need to learn). Maybe it’s a strategy, if there is no receipt because the information disappeared (heat/oil/water), then retailers don’t have to worry about returns. What happened to the days of a simple proof of purchase on regular paper?